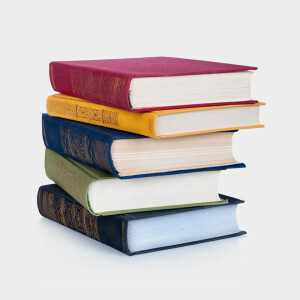 Recycle hardcover books with paper, but remove their spines and book covers first. Hardcovers are too tough for recycling equipment to process. Paperback covers do not need to be removed. Take advantage of your library and check out books. Checking out books, instead of buying them brand-new, saves paper and keeps more old books out of landfills. Free Little Library is a “take a book, return a book” free book exchange. There are over 32,000 registered little libraries that are spread out across all fifty states and seven countries. Find a free little library. Exchange books and electronics for an Amazon gift card through Amazon’s Trade-In Program. Shipping is free with their prepaid shipping labels. Make sure items are in acceptable condition. Drop off unwanted books at a charity or thrift shop. You can donate children books to the Boys and Girls Club and academic books to the Bridge to Asia program. Consider selling old books at a yard sale or to a bookstore that sells used books. There are also online marketplaces such as Amazon, ebay or AbeBooks. Two billion books are purchased annually in the United States. Keep in mind that one tree makes only about 25 books.